Dare I say this? British colonials had an almost Germanic consistency: take over, build a military-industrial complex, then administer it from the cool comfort of the highlands. Darjeeling for Calcutta; Ooty for Madras; Maymyo for Mandalay; Penang Hill for George Town. They had hill stations all over the tropics. In Darjeeling, the little railway that supported the hill station is falling apart. 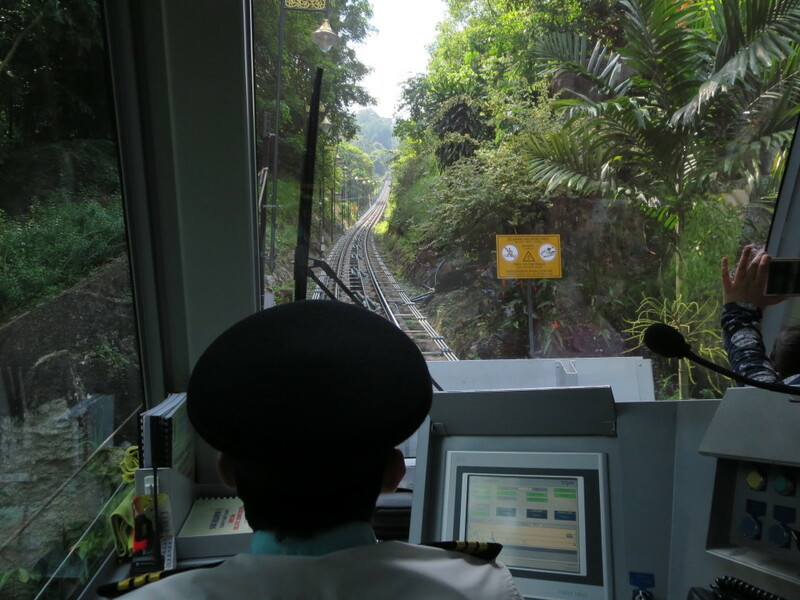 On Penang, the funicular that supported the hill station was replaced in 2011 by a sleek setup that combines some the best features of an elevator, a roller coaster, a train, and an aircraft. From the UNESCO Heritage Site center of George Town, a city bus gets us to the foot of Penang Hill, in ignorance of the thrill to come. As we debark the bus, we get a sense that whoever designed the new railway had enjoyed a trip to Disney and was especially taken with Tomorrow Land: the ticket and then waiting line winds between stainless steel tubes, the walls of the station have a curved, futuristic look, and the roof is retractable. The space age will happen soon…the architects of today’s George Town know it for sure! 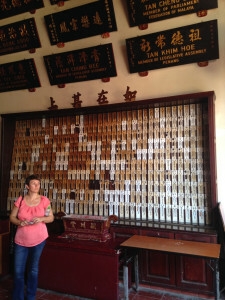 Alison pays homage to a wall of Chinese ancestors in the UNESCO section of George Town. Our good fortune will hold for a few days more. 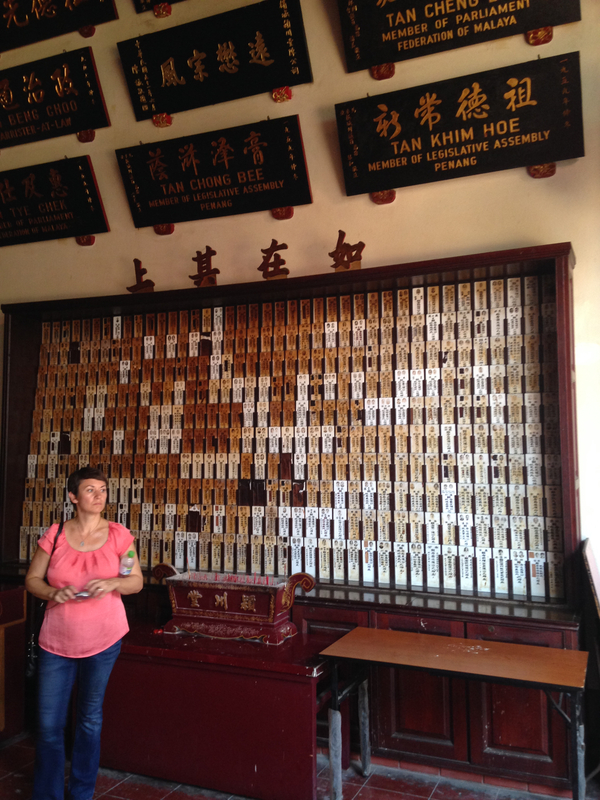 The line for tickets is short, which makes our morning trips to the Chinese family temples feel fortuitous. We’ll soon understand that our real good fortune is our exact place in line. As we enter the docking bay for our futuristic funicular, it appears that this trip is about to depart, that the one hundred people who can fit are already aboard, and that we must await the arrival of the next car. But no, the uniformed attendant waves us out of line and toward the front of the train. He motions us in the very front door. All the seats are taken, but we’re encouraged to take places—standing as if it were a subway—directly behind the driver’s small Plexiglas-enclosed cockpit. Having my one hundred, eighty-five centimeters blocking the view must be a disappointment to the seated Malays, but we’re elated. Out the strongly upward-titled nose of the train, we peer up into a canyon of jungle and at the concrete rail that rapidly diminishes and disappears. I look at Alison: “Monorail!” Her whisper is intense. Like the designer, she too fell in love with Disney’s vision of the future. I don’t point out the thin steel rails mounted atop the concrete support. And I admit, this feels much more like a monorail than a creaky 19th century funicular of the alps. The driver (Should we call him our pilot? Our Capitan?) steps into the vehicle, settles into his padded seat, surveys a row of readouts and monitors, and flicks a single switch. He’s started our launch sequence. There are quick safety announcements in Malay, English, and, I assume, Mandarin. The doors slide shut almost soundlessly. And I do mean liftoff. The acceleration makes me tighten my grip on the hand strap and flex my legs in order to stay upright. In a few seconds we are hurtling through the greenery–it’s almost a tunnel–occasionally breaking into the sunshine and catching glimpses of the shoreline, sea, and city below through the tall windows. And then, bang! We’re in a real tunnel. One hundred meters of intense, disorienting blackness. It turns out to be the steepest passenger tunnel on the planet: it’s a hair under 28°. I know this is not a bullet train, but if feels like we are in the cab of a bullet train. We can see the cables that pull us upward vibrate with the strain. The concrete beam tips more steeply upward and I work harder to stay standing. Later I am taken aback when we calculate the rate of ascent: about 450 feet vertical feet per minute. Yes, I do it in English units, because I want to compare to something else in English units. That’s like a steep climb a light aircraft. My bother’s Piper Comanche could keep pace with us, but he’d have to pour on the gas. George Town and Butterworth from Penang Hill. Altitude is definitely as good as air conditioning. We went from 35°C (95°F) in George Town to a comfortable 27°C (80°F) at the peak. Click the photo to enlarge. In the middle of the ascent, the ride gets even more thrilling. We can see another funicular hurtling down the track toward us! Yes, yes, we denizens of the 21st Century are all used to driving at seventy or a hundred or one hundred-thirty kilometers per hour and are totally comfortable how rapidly traffic in the other lane closes the distance. In a tunnel of jungle, on a steep uphill, with a nonchalant driver and the other vehicle in our lane, the rate at which these vehicles are coming together is extremely unsettling! Shouldn’t that thing be on another track?! We are irrevocably destined to collide. And just before we meet our doom, I see the concrete monorail and the small steel rails on top form a wye, splitting for perhaps twenty meters before coming back together. We go right. 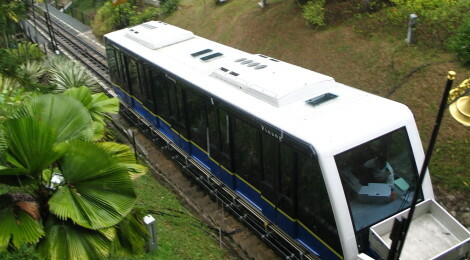 The downward funicular goes left on the passing track. We shoot by each other with no more than a meter of clearance. Zoom! We bump back to the centerline. No warning, no slowing. One zigs, the other zags. And we thank our lucky stars. We fire through the historic funicular station with equal speed and finally decelerate just as we enter the top station. I am giddy. We grin nervously at each other, thankful that it isn’t a roller coaster and doesn’t send us hurtling, sans stomachs and weightless, down the western side of Penang Hill. “We still want to walk down, right?” Our steps are unsteady as we make our way to the viewpoints high above George Town, Selatan Strait, and Butterworth across the water. 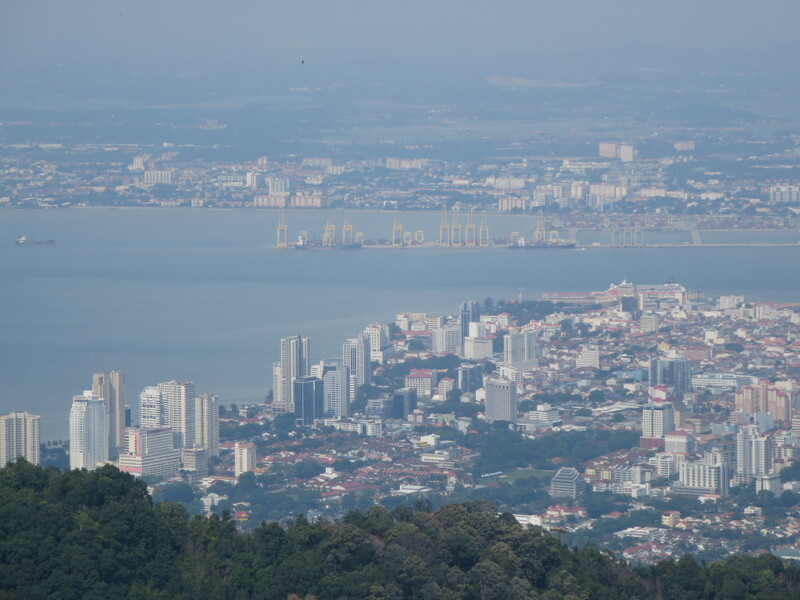 A panoramic view of the scene from the top of Penang Hill. Click the photo to enlarge (It’s big, it might take a while.). Steep and winding—fraught with monkeys, six kilometers long, dogged by erosion and mudslides—the road from the peak of Penang Hill to the Botanical Gardens is no cakewalk, but all the thrills come at a pedestrian pace.